It has only been a little over 3 months that we all indulged in the festive season of christmas. Now Easter knocks on the door, loaded with all sorts of sugary and chocolaty treats! I have to admit that the following pictures were not taken in my kitchen, but they are certainly great ideas to still have lots off fruit and vegetables on the table for the times to come. These 2 bunnies are very similar. 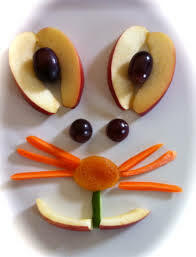 Fruit based with apples for ears (you could also use peaches for example), instead of carrots for the whiskers, you could use apple sticks to keep it all fruit. 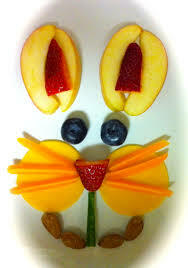 On the 2. pic I believe it is mangoes for the cheeks, you could use orange slices…let your imagination fly. 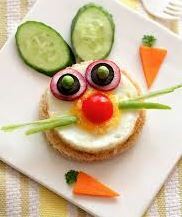 This is the vegie version: sitting on a rice cracker is an egg with tomato and celery for nose and whiskers. For the eyes you could also put dollops of Vegemite on. 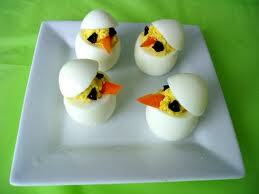 These hard boiled eggs can be filled with some curried egg yolks, or mashed and spiced up sweet potato for example. Boil eggs, spoon the yolk out, spice it up and out it back in. This is really easy. 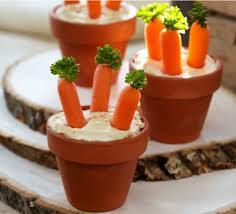 Any dip to your liking can fill the little planter pots and you can not just put carrots in, but celery stalk with a little bit of leaves left on them on the top will just look as nice and make the perfect health snack. 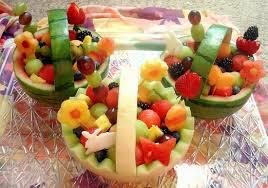 And check out these adorable fruit baskets. Obviously a whole melon serves as the basket, and then fill it with whatever you like, preferable fruit. Just a quick shout out to remind you that there is a lot of stuff happening in and around Perth. Personally I just took part in the Color Me Rad Fun Run held at Curtin Uni last weekend, with its main contributions going to MS research. It is a lot of fun to take part in these things, supports good causes and keeps you fit and motivated at the same time. For the next 12 months to come I will supply you with 12 easy little things that you can implement or change in your daily routine to achieve a healthier living. Each newsletter will contain 1 thing. Therefor you will have a whole month to work on including it into your routine before the next thing comes. Aim for a minimum of 2 liters per day. Only pure water counts towards that. Any other caffeinated or sugary drink requires more water to counteract the effects. If you are exposed to high temperatures or sweat because of exercise or work, increase that minimum of 2 liters to 3-4 liters. Coconut water is a great source for those that need extra electrolytes. Ditch your sugary sports drinks! Have a read through the blog entry from 2 months back, but also go and do some research on the net yourself. more confused. When that happens I want you to ask yourself then what makes most sense to you?! Also go out and reach out to others that you trust and start a conversation about this. The more you talk about it and deal with it the clearer it will become to you what is right for you to do! This is the Superficial Back Line (SBL), at least graphically. In real it looks slightly different, but it gives you the general idea. As you can see the connective tissue of the SBL covers the back in 2 lines really, all the way from underneath the foot across the legs and the backside over the head to the eyebrows. In dissection it is possible to lift these sheets of tissue off in 1 piece!! What does the SBL do postural? It supports the body in full upright position, preventing it from falling into a forward bend (original fetal position, more later). To do so the muscles engaged here are slow-twitch endurance type muscles fibers. It is a continuous holding position and requires heavy duty bands like the Achilles tendon. What does the SBL do in movement? The SBL creates extension (upright) as well as hyper-extension (backwards bend), with exemption at the knees, where it flexes. When we are born we are in a flexed position (back rounded, hips and legs flexed). As we grow and develop strength as well as competence, you can say that the SBL is linked to maturity and vision as it brings us into an easily maintained fully upright position. It also is linked to characteristics like openness, courage, stamina and groundedness. Stand with your feet (bare feet is necessary) together, upright, hinge forward from the hips and let the upper body hang down, touch your feet or the ground if you can. If not that is fine too, do not push, just go as far as you can with ease. All I want you to focus on is how it feels to you, make note of how far you can reach. come back up. Now take a golf ball, place it under one of your feet, apply some pressure so you have good hold of it and start rolling and pushing it along underneath your foot. Feel for differences and once you find areas that feel a bit more tender spend a bit more time there, slightly moving/rolling the ball forth and back and side to side, before moving on. Do so for about a minute. Then change over to the other foot and repeat. Once done, I want you again to simply hinge over at the hips letting the upper body fall down and take note of how far you can reach this time and how it feels… Now, most people will feel a difference, but there are always exceptions to the rule. So if you did not experience a big difference here there is 2 possibilities: 1. You have good range of motion. 2. You have issues in other areas of the body, which are not as easily effected by working on the plantar fascia. However, for those that felt a difference, it simply shows you how working on one area of the SBL has an effect on the whole of the line. As I mentioned earlier, when we are born our body holds a flexed position with so called primary curves. These are the back of the head (cranial), the upper back (thoracic), the bottom (sacrococcygeal), and the heels (refer to picture below). 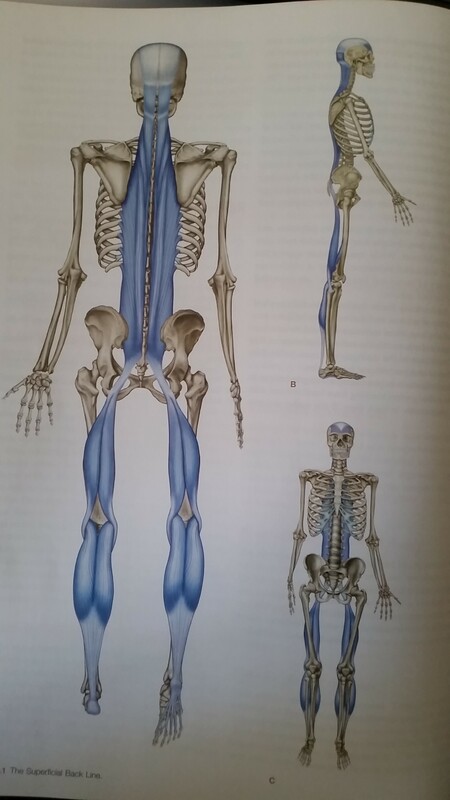 As we develop into our upright posture (first we lift our head, then the upper body and finally come into standing position) we develop the secondary curves: The neck (cervical), the lower back (lumbar), the back of the knees and the arches of our feet (refer to picture below). Since the primary curves are very much interlocked by their bony structures (the skull, the rib cage, the hips, and the heel bone), the secondary curves rely more on the balance of the soft tissues. Yes, your foot arches are not bony structure, they are determined by soft tissue, fascia and muscle. If you are still bare foot, stand up, feet lat on the ground, now engage your big toe (push it into the ground). You will see movement where your arch is/should be. Saying all this it makes sense, that if there are issues with the SBL, if it is not balanced properly, we will most likely see changes in the secondary curves: Flat or cupped feet (Yes, both is possible, but explanation here will lead too far), often locked knees, hyper-extension through the lumbar, and hyper-extension through the cervical area as well. Those changes can then lead to tilts and shifts through the primary curves, for example and anterior pelvis tilt. Cats always fall onto their feet! When in the air a cat uses its eyes and ears to orientate its head horizontally, which puts tension into the neck muscles (eyes are connected to muscles in the back of the head), which then sends a signal to the rest of the spine, organizing its feet to be under its body before it hits the floor. Our body is the same, though in a falling situation we are not instinctive enough anymore to land on our feet at all times. Anyhow, how we use our neck, determines what the rest of the back does, hence working the neck muscles is often key when clients present with any kind of back issues (from the neck to the hips). This should explain a bit already; Why I often work areas that in the first place do not seem to relate to the presenting physical issue. Over the next months to come you will learn about the other ‘trains’ in our bodies and hopefully will give you an even greater understanding! 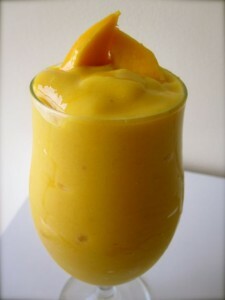 When mangoes were in season I bought heaps and heaps, cut them into pieces and stuck them in the freezer. taste you like – ENJOY!! !